Original (Not a reproduction) Historic Price Quotation Sheet from the New York Stock Exchange issued in 1860. This historic document shows the "First Board" prices of Stocks listed on the New York Stock Exchange. The First Board represented trading from 10:30am to Noon. (The Second Board represented trading from 2:30pm to 3:00pm) This item is over 148 years. This closing price summary was printed on a daily basis and sent to brokers and Wall Street firms. 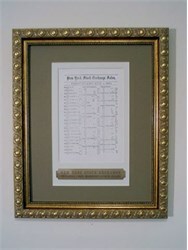 Classic Frame overall size 13 1/4" x 16 1/4", double matting, clear glass, archival mounting, engraved brass plaque "New York Stock Exchange - Original Morning Stock Quote - 1860" This looks much better in person than appears in the scanned image. Our sales price includes the historic NYSE price quotation sheet, framing as described above, labor, packaging and shipping within the continental U.S. The origin of the NYSE can be traced to May 17, 1792, when the Buttonwood Agreement was signed by 24 stock brokers outside of 68 Wall Street in New York under a buttonwood tree on Wall Street which earlier was the site of a stockade fence. On March 8, 1817, the organization drafted a constitution and renamed itself the "New York Stock & Exchange Board". (This name was shortened to its current form in 1863.) Anthony Stockholm was elected the Exchange's first president. The first central location of the NYSE was a room rented for $200 a month in 1817 located at 40 Wall Street. The NYSE was destroyed in the Great Fire of New York (1835). It moved to a temporary headquarters. In 1863 it changed its name to the New York Stock Exchange (NYSE). In 1865 it moved to 10-12 Broad Street. The Dow Jones Industrial Average (DJIA) was created by Dow Jones & Company, a financial news publisher, in 1896. Volume of stocks traded had increased sixfold in the years between 1896 and 1901 and a larger space was required to conduct business in the expanding marketplace. Eight New York City architects were invited to participate in a design competition for a new building and the Exchange selected the neoclassic design from architect George B. Post. Demolition of the existing building at 10 Broad Street and the adjacent lots started on 10 May 1901. The New York Stock Exchange building opened at 18 Broad Street on April 22, 1903 at a cost of $4 million. The trading floor was one of the largest volumes of space in the city at the time at 109 x 140 feet (33 x 42.5 m) with a skylight set into a 72-foot (22 m) high ceiling. The main fa�ade of the building features marble sculpture by John Quincy Adams Ward in the pediment, above six tall Corinthian capitals, called �Integrity Protecting the Works of Man�. The building was listed as a National Historic Landmark and added to the National Register of Historic Places on June 2, 1978. In 1922, a building designed by Trowbridge & Livingston was added at 11 Broad Street for offices, and a new trading floor called "the garage". Additional trading floor space was added in 1969 and 1988 (the "blue room") with the latest technology for information display and communication. Another trading floor was opened at 30 Broad Street in 2000. With the arrival of the Hybrid Market, a greater proportion of trading was executed electronically and the NYSE decided to close the 30 Broad Street trading room in early 2006. In late 2007 the exchange closed the rooms created by the 1969 and 1988 expansions due to the declining number of traders and employees on the floor, a result of increased electronic trading. The 11 Wall Street building was designated a National Historic Landmark in 1978.